Burlingham Hall and Hoveton Hall were owned by the Burroughes family at the time of Repton’s Norfolk commissions, and though the ‘big house’ is gone, the walled garden at Burlingham still contains the somewhat ravaged elaborate trelliswork gate known as Repton’s gate. Book the LUXURY YURT in the gardens of Burlingham Hall for any two nights over that weekend and receive free entry to over twenty participating village gardens included in the price. Lacking shop, school or pub as focal points, the villagers of North Burlingham, unified by a love of gardening, joined forces to form a Gardening Club and open selected gardens one day in June. Eleven years later, much money has been raised and distributed to local, national and international causes. We have now made donations to Lilac (part of The Bic C), Nelson’s Journey, a compost toilet project: Toilet Twinning, Send a Cow, Caister Lifeboat, Wherry Maud Trust and a small Great Yarmouth Charity offering Xmas Lunches. This year, Sunday 9th June, we expect to have more than twenty gardens open in Main Road and The Green, linked by the woodland path past St Andrew’s Church. We have live music, teas, Norfolk ice cream and a BBQ planned. Gardens are open 10.00 to 4.00, the entry fee for adults is £4 and there’s free parking at Main Road North Burlingham NR13 4TA plus limited Blue Badge parking at The Green. In 1764 Christabell Negus was born to Henry and Mary Negus of Hoveton Hall. She subsequently married James Burroughes of Burlingham Hall when she was 25 - and moved to Burlingham Hall. James died in 1803 leaving Christabell with 7 sons and a daughter. She remained at Burlingham but in 1807 her father died, and with Christabell as his only heir, she became owner of Hoveton too. Her eldest son - Henry Negus Burroughes - was due to inherit Burlingham in 1812 at age 21, and she decided when that time came she would go back and make Hoveton her home - though she wanted to demolish old Hoveton Hall and start afresh. In 1809 she engaged Humphry Repton to design a new house and gardens. It was finished by 1812 and she moved in with her remaining younger children. Though it is not known if Repton had much influence on her Burlingham home, it is highly likely he would have reported to Christabell there in the three years spent developing Hoveton. She was a keen and knowledgeable gardener herself, and would have wanted to show him the notable parkland and gardens she had made in the twenty years she’d been there. In any event, there is still today, at a point in the southern wall of the walled garden, the remains of an elaborate gate giving the most direct access to the nearby Burroughes family church of St Peter. The gate is known locally as ‘Repton’s Gate’. Christabell died in 1843, leaving Hoveton Hall to eldest son Henry. It was occupied by various Burroughes family members and rented to the Gurney family but finally sold 30 years later when Henry died. She was buried at St. Peters, North Burlingham, with James. 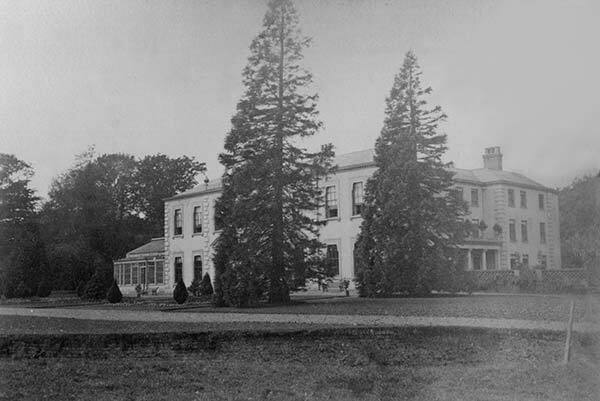 Burlingham Hall (above) was demolished in 1952 when under Council ownership. The walled garden, stable buildings and 7 acres of garden remain.